The music produced from the remarkable collaboration of Georges Ivanovich Gurdjieff and Thomas de Hartmann typifies the creative explorations undertaken by many artists just after the turn of the century. In visual art, Wassily Kandinsky (1866-1944), explored abstraction in both sight and sound, while composer Alexander Scryabin (1872-1915) proposed an aesthetic format through his compositions that entailed the collaboration of colors, sounds, scents and movement. Each of these artists and thinkers created an art that was the literal embodiment of a deeply held philosophical system of beliefs. Gurdjieff, Kandinsky and Scryabin freely drew from an informed mixture of Greek mythology, Christianity, Hinduism, Theosophy and Chinese philosophy to complete their own personal creeds. Each felt that their particular artifact of sight or sound, when fully experienced, would conjure forth powers which modern man had allowed to atrophy. However, the musical aspirations of Georges Gurdjieff differ in the respect that music and movement were an inextricable part of his combined pedagogy and enlightenment. Coming from Alexandropol (today: Leninakan), Armenia, Gurdjieff's attitudes were textured by the fact that since the 3rd century B.C., this area had become the literal crossroad for the diverse cultures that ringed the Black, Caspian and Mediterranean Seas. The horizon of his musical art never widened. Instead, it grew gradually and inexorably, his gaze focused more and more on using music to gain mastery over the ethological resources of the human spirit and moral behaviour. It is ironic, indeed, that someone with such an unambiguous and immediate use for music in furthering a prodigious philosophical narrative, was so ill-equipped with the general skills of the art. Thomas de Hartmann was a fellow seeker of the truth. He saw in Georges Ivanovich Gurdjieff not the random compilation of bits and pieces of a variety of obscure and forgotten civilizations, but a unified cultural expression forged by an intense dialectical encounter. Thomas de Hartmann, the composer, approached Gurdjieff as a codified musical system of melodic, rhythmic and harmonic behaviour. In a sense, Thomas de Hartmann did for Georges Gurdjieff what Belá Bártok had done for the Magyar Dallok of Hungary. De Hartmann's real genius lies in his gift for taking the raw musical utterances of Gurdjieff and transforming them into sophisticated piano compositions indebted both to the 19th century European art music tradition and the provocatively inspired visions of Georges Ivanovich Gurdjieff. This three volume compilation is tribute to the genius of three uniquely talented mena philosopher, a composer, and a pianist-musicologist. These works began with the philosophical searchings of Georges Ivanovich Gurdjieff, an Armenian intellectual at the turn of the 20th century. His homeland was the crossroad for the diverse cultures that ringed the Black, Caspian and Mediterranean Seas. His fascination with the human spirit and his searching for the truth took him on vast journeys through India, Tibet and China. A keen observer, Gurdjieff, began to accumulate bits and pieces of musical traditions. These he combined with his provocatively inspired visions as a universal symbol of his philosophical beliefs. Gurdjieff, however, did not have the musical ability to transform his abstractions into reality. Fortunately, one of his disciples was a gifted and successful composer in St. Petersburg, Thomas Alexandrovich de Hartmann, whom he met in 1917. As a fellow searcher for the truth, de Hartmann was eager to transform the raw musical utterances of Gurdjieff into sophisticated piano compositions. Those scores, sadly, were left in a state of disarray in the estate of de Hartmann. Decades later, musicologist, professor, and pianist Cecil Lytle, became the final element of the equation. In the mid 1980s, he and a team of researchers began a three year quest, scrupulously studying the scattered files of de Hartmann's scores, assembling the first truly accurate arrangements of the Gurdjieff/de Hartmann legacy. 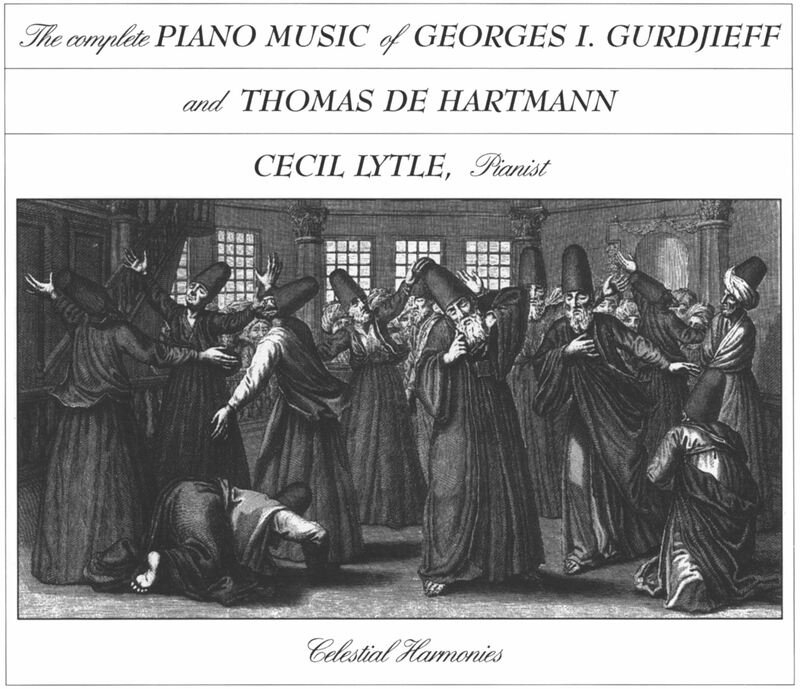 A man in touch with the philosophical, as well, as the musical nature of the works, Lytle performs them with deep emotion and unsurpassed skill. The three volumes vary in their nature. Seekers of the Truth (14020-2) presents the reflective, ceremonial music of Gurdjieff/de Hartmann's majestic suites. Reading of a Sacred Book (14028-2) contains some of their dance and character pieces of a more lively nature. Words for a Hymn to the Sun (14035-2) completes the trilogy with the final works of the great spiritual teacher, Georges Gurdjieff. Truly, these dramatic piano performances serve as the highest praise to three remarkable individuals. 1-9 Hymns From A Great Temple, Hymns 1-9 23'35"
10-17 Rituals of a Sufi Order, Parts 1-8 14'04"
1 Reading from Sacred Books 3'56"
2 Prayer and Despair 1'39"
5 Orthodox Hymn from Asia Minor 3'10"
6 Hymn of Good Friday 1'45"
8 Prayer and Procession 4'36"
9 Hymn of Easter Wednesday 4'58"
10 Hymn for Easter Thursday 4'45"
11 Hymn to the Creator 2'06"
12 Hymn for a Great Temple 5'41"
14 Holy Affirming. Holy Denying. Holy Reconciling 4'11"
15 The Song of the Resurrection of Christ 3'36"
16 Easter Night Procession 6'28"
1-9 Journey to Inaccessible Places, Parts 1-9 21'53"
10 Reading of a Sacred Book 6'01"
11-24 Dances and Chants of the Seids, Parts 1-14 30'58"
1 Song of the Aisors 3'21"
2 Kurdish Shepherd's Dance 1'12"
3 Song of the Fisher Women 2'20"
9 Song of the Molokans 1'35"
10 Kurdish Song of the Flutes 1'23"
18 Assyrian Women Mourners 2'58"
19 Tibetan Masked Dance 2'34"